Tag line: "When the news ran out...they made their own"
Years before television news (or, for that matter, television itself) hit the scene, newsreels (which usually played in theaters before each feature film) were keeping the masses informed, relating the noteworthy events that shaped their world both at home and abroad. Newsfront, the award-winning 1978 Australian film directed by Phillip Noyce, pays tribute to these brave men and women who documented the first half of the 20th century, sometimes risking life and limb in the process. The fact that it also features interesting characters and an engaging storyline is a nice little bonus. Starting just after World War II and taking us to the advent of television in the mid-1950s, Newsfront throws a spotlight on the McGuire brothers: cameraman Len (Bill Hunter), an employee of the Cinetone Newsreel Corporation whose dedication to his job is unparalleled; and Frank (Gerard Kennedy), who left Cinetone to work for a rival company, a move that hasn’t exactly endeared him to Len. Along with his new assistant, Chris Hewitt (Chris Haywood), Len travels all around Australia, sometimes spending weeks away from home, in an effort to capture the news of the day. While his hard work has consistently impressed his bosses, including Cinetone’s general manager A.G. Marwood (Don Crosby), Len’s demanding schedule takes its toll on his marriage to Fay (Angela Punch McGregor), a devout Catholic who resents the fact she’s raising their three children on her own. As for Frank, he leaves both Australia and his longtime girlfriend Amy (Wendy Hughes) behind and sails to America, where he intends to break into the movies. Over the years, Len visits many different areas, covering everything from a long-distance car race to a devastating flood, all the while realizing that a new invention, called television, might one day soon make cinematic newsreels a thing of the past. 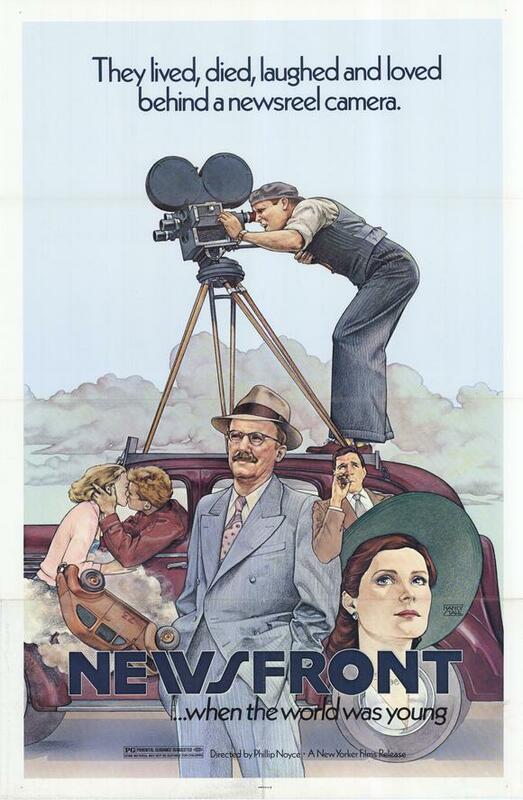 Presented in both black & white and color (which very much resembles the saturated technicolor you'd find in the movies of the ‘40s and ‘50s, such as Douglas Sirk’s All That Heaven Allows), Newsfront flawlessly blends actual newsreel footage with its dramatic tale of an industry in decline, making it difficult at times to determine where the archival material ends and the film itself begins (the sequence where Len and Chris are covering the Maitland floods of the 1950’s is a prime example, with real-life images of the raging waters interspersed with scenes of Chris rowing a boat through the flooded streets). In addition to its authenticity, Newsfront features a number of outstanding performances, the most impressive of which is Bill Hunter’s strong yet understated portrayal of Len, the cameraman whose job means everything to him. Also good in supporting roles are Angela Punch McGregor as Len’s oft-suffering wife and Bryan Brown as Geoff, an editor at Cinetone and a Communist sympathizer whose political leanings make him something of an outsider in 1950’s Australia. And keep an eye out for Bruce Spence (Where the Green Ants Dream, The Road Warrior), who has a brief but memorable appearance as a driver whose car meets with an unfortunate accident. More than anything, though, Newsfront focuses on those people who, to get the job done, occasionally put themselves in harm’s way; among the real-life footage presented throughout the movie is that of a World War II battle between U.S. Marines and the Japanese, a segment shot by newsreel cameraman Damian Parer, who, while filming the skirmish in Sept. of 1944, was killed by sniper fire as his camera was running. It’s a grim reminder of the dangers involved in this line of work, and by shining a light on moments such as these, Newsfront ensures that, even all these years later, the sacrifices made by those who brought us the news during this tumultuous period will never be forgotten.